Hazel Gladys McKenzie, 91, of Litchfield, passed away at St. John’s Hospital Hospice, Springfield, IL on Friday, November 30, 2018. She was the daughter of the late John Lafayette “Mose” McCann and his wife Birdie Gazelle (Boyd) McCann. Gladys was born in Purdy, TN (near Selmer) on the 13th of February, 1927. She attended school in Tennessee and later received her GED from Litchfield High School. She married Rady Onis. McKenzie on August 30, 1941 in Corinth, Mississippi. Rady survives her and they recently celebrated 77 years of marriage. Gladys and Rady came to Illinois in May, 1942, looking for work, and settled in Alton, IL. About 1943 they moved to Mt. Olive, then to Harvel, and finally settled in Litchfield where they have lived approximately 68 years. Gladys worked at Brown Shoe Company in the early years, for many years at St. Francis Hospital and later as a home health care giver. She excelled in knitting, crocheting, and quilting. 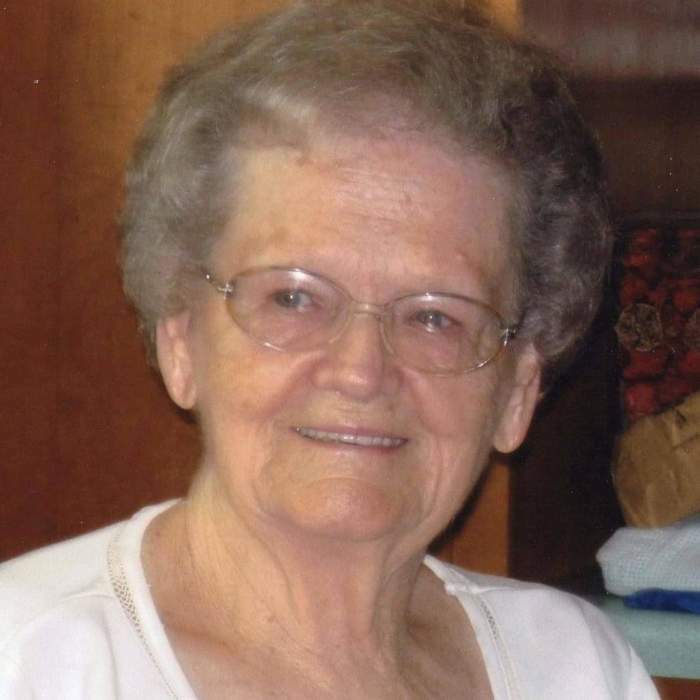 She was an avid wrestling fan and always enjoyed working on her family tree. Gladys is survived by her husband Rady; three sons, Sam (Mary) McKenzie, of Livingston, IL; John & Ron McKenzie of Litchfield; also three daughters, Lavonne Sutton, of Marshall, MO; Jeanne (Jack) Barrett of O’Fallon, IL, and Sara Rhodes of Litchfield. Gladys is also survived by 19 grandchildren, Samuel Sutton, Linn McKenzie Fullerton, Jack Barrett II, David Rhodes, Melissa Barrett Freppon, Tasha McKenzie Lowery, Wendy McKenzie Glauber, Stacy McKenzie, Lesley Barrett Ingamells, Mackenzie Rhodes, Tomas Barrett, Samuel C. McKenzie, Michael Rhodes, Mallory McKenzie, Brittney Barrett May, Sara Spears, William Stewart, Nicholas Barrett, Ronald McKenzie II. Also surviving are 28 great grandchildren and 3 grt grt grandchildren. She was preceded in death by her parents, mentioned above, and 2 brothers, John and William “Bill” McCann; four sisters, Ethel McCann Murray, Ruby McCann Bobo, Colleen McCann Brietwiser, and Ernestine Murray. Also, one son Ray, who died at the age of 19 and a great granddaughter, Katerina McKenzie. Funeral services to be held in Plummer Funeral Home, Litchfield, Thursday, December 6, 2018 at 11:00 a.m. Rev. Jack Barrett, Sr., son-in-law of Mrs. McKenzie will officiate. Visitation will be Wednesday evening from 4:00 until 7:00 p.m. Burial will be at Elm Lawn cemetery in Litchfield. Memorials can be made to the Montgomery Cancer Assn. or Litchfield Volunteer Fire Dept.